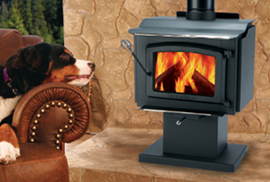 Ed’s Woodshed has been a premier retailer and installer of fireplaces and stoves in Pittsburgh for over thirty years. 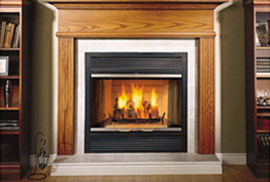 Founded in 1983, Ed’s Woodshed was established to provide, and service, quality fireplaces, and stoves at an affordable price. This guarantee is still upheld today as we only work with quality manufacturers, such as Vermont Castings and Regency. Improve your home atmosphere. 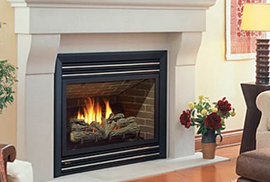 Pittsburgh fireplaces and stoves add ambiance to any room in your home, can help lower utility bills, are an effective means of adding additional warmth, especially in those cold winter months, and can add monetary value to your home. Whether you’re gathering as a family, spending a romantic evening with that special someone, or spending time alone with a cup of hot cocoa and a good book, these traditional—or modern–heating sources, can enhance your living space. Ed’s Woodshed provides a variety of style options to suit your individual tastes from electric fireplaces to gas fireplaces and more. More contemporary units and linear outdoor fireplaces are also now available, helping to make your home or backyard a cozy retreat anytime throughout the year. We are a dependable, full-service provider. Ed’s Woodshed is the only Pittsburgh area retailer who can promise you “one-stop shopping.” Select your products and then take advantage of our full-range of installation services. 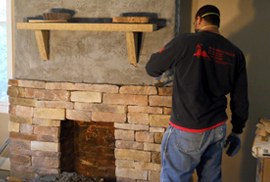 From framing and drywall to stonework and mantles, Ed’s Woodshed does it all! If you are looking for full-service assistance, look no further. Ed’s Woodshed can provide you with quality care and consistency that you can trust, all at a reasonable rate.